The call came late in the afternoon when he was taking some foreign journalists to meet victims of clinical trials near the central city of Indore. 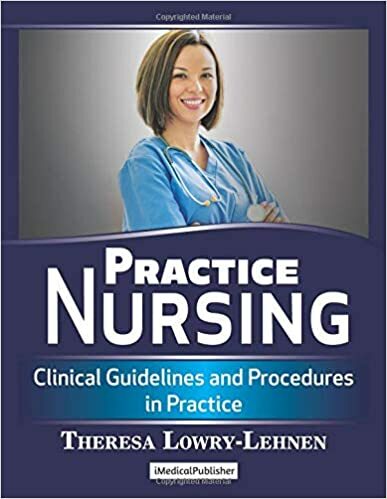 It was 13 July 2013, six days after the local police had caught half a dozen students from a city hotel who they suspected were plotting to rig medical school exams. 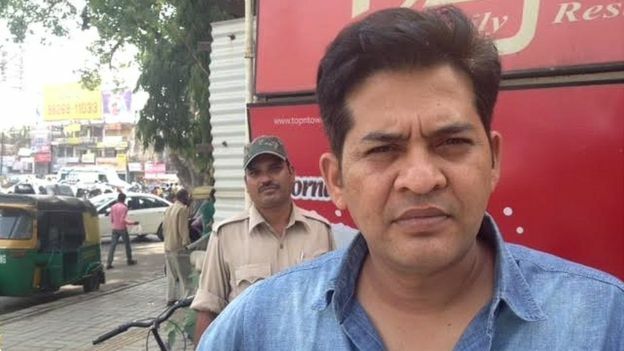 Dr Anand Rai, a medical officer himself, has the reputation of being a feisty - if sometimes, reckless - whistle-blower, so he was helping the police with intelligence about how medical school exams were being rigged in Madhya Pradesh. "There was a man on the line threatening to kill me. He said don't do this job any more," says Dr Rai, 38. The man rang off. Two minutes later, the man called again. "Don't you give this number to the police. You will pay for it, if you do," he said, before hanging up. Dr Rai promptly handed over the number to the police, who tracked the call to Mumbai. A local police team went to Mumbai and arrested the caller. The man, an assistant professor in a private medical college, turned out to be the mastermind of what has now turned out to be one of India's biggest scandals, involving the rigging of mainly medical school admissions. 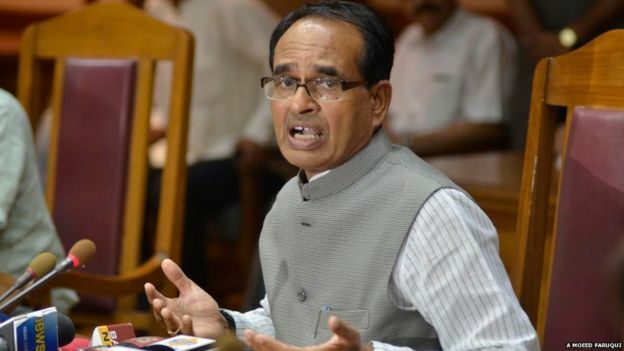 He told investigators that Vyapam officials were complicit in the scandal. 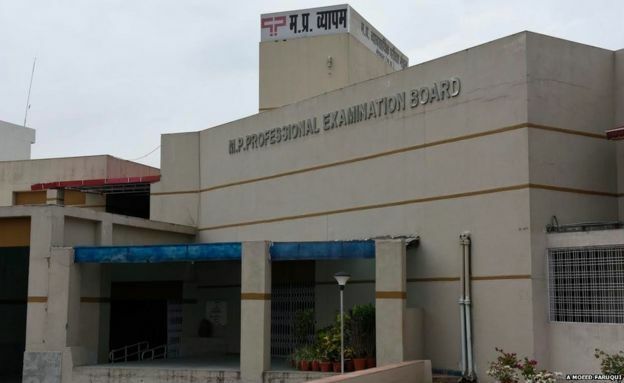 Vyapam is the Hindi acronym for anoffice that conducts more than 50 examinations for government jobs and medical school admissions in Madhya Pradesh. Candidates hire impersonators - medical students from neighbouring states - who write their exam. Impersonators even appear for physical education tests. Candidates pay 'scorers' - again medical students themselves - who sit close to them during the examination and help them cheat. Question papers are leaked and sold to candidates. Answer sheets are rigged and higher marks given to the candidate. Unfinished answer sheets are filled up later by teachers involved in the scam. The scale of the scandal boggles the mind. Some 2,530 people have been accused since 2012. Around 1,980 people have been arrested; and 550 people are still sought by police. Twenty courts in Madhya Pradesh are looking into 55 cases registered in connection with the scandal. 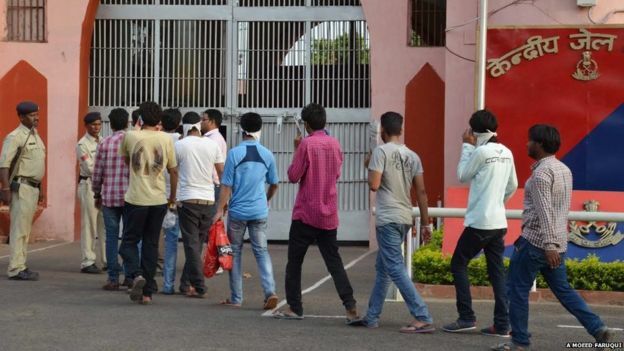 By one estimate, some 140,000 men and women have sat exams conducted by Vyapam since 2007. The government says more than 1,000 "illegal appointments" have been made through Vyapam, although whistle-blowers like Dr Rai say the figure is much higher. Question papers were leaked, answer sheets rigged, impersonators - themselves bright, young students - were hired to sit for candidates, and seats sold to the highest bidder. Anything between 1m rupees ($15,764; £10,168) and 7m rupees was paid for a seat. Investigators have examined nearly 10,000 photographs of students, many of which were forged by impersonators. They have gleaned electronic information from at least five hard drives, innumerable pen drives and laptops. That is not all. In a mysterious twist, some 33 people - mostly accused in connection with the scam have died in the past two years - raising suspicions and all kinds of conspiracy theories. Ten of them have died in road accidents, something, which one investigator says, needs further investigation to dispel doubts of foul play. It is difficult to link all these deaths to a scandal, but they have, ironically, stirred India's notoriously Delhi-centric English-language media to wake up and begin covering a story that has been brewing for two years. The deaths, according to commentator Mukul Kesavan "are both strange and deeply frightening". The roll call of those accused in the scandal is a staggering list of who's who in Madhya Pradesh: a former ruling BJP minister, the personal assistant of a high ranking official of the RSS (India's biggest Hindu nationalist organisation), a top private medical school owner, aides of Chief Minister Shivraj Singh Chouhan and state governor Ram Naresh Yadav, the brother of a senior police official, top bureaucrats, policemen and a mining magnate. No wonder, then, that the scandal has scarred the ruling BJP government most. "This is bigger than Ali Baba and Forty Thieves," admits Madhya Pradesh Home Minister Babulal Gaur. "The scandal has given a bad name to the state. Our doctors are suffering. If you are a doctor from Madhya Pradesh, people will ask 'are you real or fake'." India's medical education system is one of the largest in the world. There are 381 medical schools - both government-run and private - associated with universities. More than 70,000 students turn out for undergraduate and post-graduate exams every year. India produces some 30,000 doctors a year. 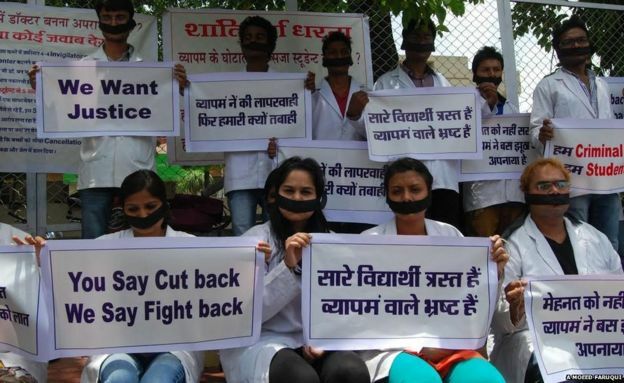 Rigged medical school examinations taint the image of Indian doctors. Last month, India's Supreme Courtordered more than 600,000 students to retake the main medical schoo...after they found that the question paper had been leaked. As Dr Rai tells the story, rigging medical school exams has been going on for a while in the state. Successive governments have turned a blind eye, although the ruling three-term BJP government is looking more tainted than the others. He talks about 32 cases of cheating and impersonation in medical schools that were filed by the police before the Vyapam scam exploded in 2013. "It is a criminal nexus of politicians, bureaucrats, police officers, students, teachers, agents, brokers - everyone is involved." He says he first realised that something was wrong when he took his medical school exam in 1994 and the paper was leaked. The exam was cancelled and held anew. A medical college professor was accused of the leak. A year later, somebody pumped 40 bullets into him and killed him. When Dr Rai appeared for the post-graduate exam in 2005, he says he found a strange pattern in the list of top 10 ranking candidates. "All the top 10 were sons and daughters and relatives of successful officials and police officers. It was all very fishy. Then I found that the top rankers even lived in the same medical school hostel. We protested and demanded an investigation but nothing happened." Four years later, Dr Rai, who works as a medical officer in a rusty government office and has armed protection, received the first death threat on the phone. He says he had informed the police of a medical school exam question paper being leaked. Some 40 parents and children were arrested. He says people from within Vyapam leaked the paper, and changed it when the leak was discovered. "Vyapam is the proverbial tip of the iceberg. This is happening all over the country," says Chandresh Bhushan, a retired judge who heads a three-member "special investigative team" set up to monitor the investigation by the local police. "This is the most audacious and high-tech scandal I have come across. One man, who was caught, was alone responsible for 300 bogus recruitments. Can you believe that?"